Tottenham overcame an early–and controversial–penalty concession and an injury to Harry Kane to edge a Man City side that held some attacking stars out, while Liverpool had little problem with Porto in their Champions League quarterfinal first leg. Liverpool and Tottenham hold the edge after the first legs of their respective Champions League quarterfinals. Hugo Lloris saved a controversially-given Sergio Aguero penalty kick, and despite losing Harry Kane to an ankle injury, Tottenham still beat Manchester City 1-0 thanks to Son Heung-min’s 78th-minute strike. Liverpool has double the advantage after a 2-0 win over Porto at Anfield. Naby Keita’s deflected shot put Liverpool ahead within five minutes, and Roberto Firmino added a second before halftime to help the Reds assert their control. When Mauricio Pochettino’s Tottenham became the first side to beat Pep Guardiola’s Manchester City in 2016, it was Spurs’ physicality that upset City. Although City had won their last three meetings with relative ease, Guardiola had spoken before the game of how he troubled he was by the power of Spurs. His team selection reflected that and perhaps became a self-fulfilling prophecy. This was City in the 4-4-1-1 out of possession that had stifled Liverpool at Anfield to secure a 0-0 draw in October, with the fullbacks sitting deep. The result was a slightly scrappy game, one that resulted in an ankle injury for Kane that will probably keep him out for the second leg and possibly quite a bit longer, given its to the same ankle that caused him to miss time earlier this season. Perhaps it would have been different had Aguero not had his early penalty saved, but the game was settled by Son, exploiting Fabian Delph’s relative unfamiliarity with the left back role to slam a shot under Ederson with 12 minutes remaining after doing well to keep the ball in play after an initial heavy first touch. Ten minutes in, Raheem Sterling wobbled along the edge of the Tottenham box and hit a shot. Danny Rose dived in to block and the ball spun through for what–other than those who wondered if David Silva might be offside–everybody in the ground thought was a corner. But before it could be taken, it became apparent that referee Bjorn Kuipers was standing with his finger in his ear. Had it struck Rose on the arm? As Kuipers trotted over to check on the pitchside screen, it became apparent it had–and that, if the Presnel Kimpembe incident against Manchester United had been a handball, this one was as well. The video showed Rose lunging towards the ball, his left arm slightly raised as he did so. He had fairly clearly not tried to handle the ball, but equally the raise of his arm, however natural it may have been with regards to his stretch, extended the spread of his body. Sure enough, the penalty was given, to which there are a number of things to be said. Firstly, by the criteria UEFA has used in the Champions League, it was a penalty. Secondly, that in the Premier League, which seems to take the view that a player really has to try to commit a handball to be penalized, it may not have been. And thirdly, not a single player appealed. It’s an imprecise response, but if nobody on the pitch or in the stands thinks it might be a penalty, are the regulations right? Finally, if we are to be so pernickety about handballs, why was there no review of, for instance, encroachment on the penalty, the clash between Harry Kane and Fernandinho when both appeared to aim elbows at the other, or of whether Sterling’s tug on Christian Eriksen later on may have continued into the box? At the moment, the practice of implementing video review all seems very arbitrary. For much of this season, Jordan Henderson has been a figure of mockery for a certain section of Liverpool fans. It’s true he is not the most graceful player–that famous issue with his gait that persuaded Alex Ferguson he wasn’t worth signing–but nor is he a natural holding midfielder. Rather, it is a role to which he was not particularly suited but one that he was prepared to fill because Jurgen Klopp needed him to. Last season, he was relatively effective in the position, because Liverpool pressed so hard. This season, as Liverpool has adopted a slightly more conservative approach, Henderson’s lack of instinctive positional sense has been exposed. But with Fabinho taking over as the anchor, Henderson has been released into a more attacking role on the right of the three central midfielders. He helped turn the game at Southampton on Friday and was instrumental in Liverpool’s win here as well, with his exquisite pass to Mohamed Salah setting up the second goal for Roberto Firmino. 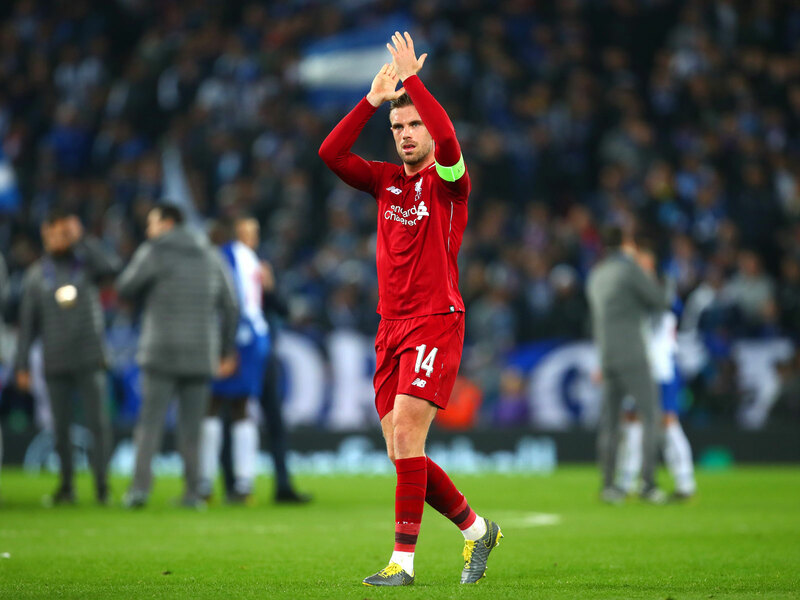 Liverpool may not have replicated its 5-0 win over Porto in the first leg of their last-16 clash last season, but it's comfortably ahead going into the second leg in Portugal, and it has, in large part, Henderson to thank.